Riyom is a Local Government Area in Plateau State, Nigeria. Its headquarters are in the town of Riyom to the north of the Area at9°38′00″N 8°46′00″E﻿ / ﻿9.63333°N 8.76667°E﻿ / 9.63333; 8.76667. It has an area of 807 km² and a population of 131,557 at the 2006 census, which is predominantly Berom. The LGA has boundaries with Kaduna and Nasarawa State. It is the gateway to the State when coming from the East and from Abuja. The postal code of the area is 931. 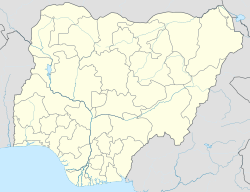 This Plateau State, Nigeria location article is a stub. You can help Wikipedia by expanding it.